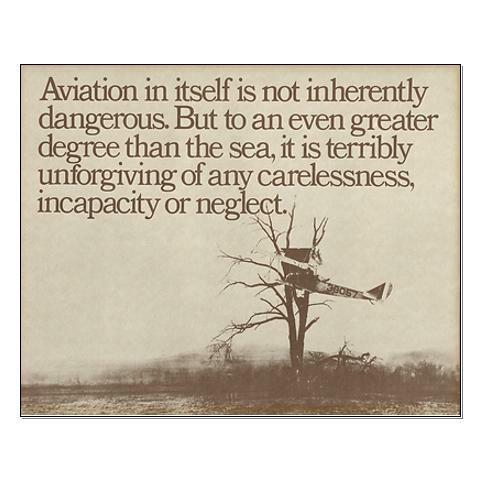 I think its time again to haul out this sad picture, which hangs in just about every flight school or ops office and which has served to warn generations of new pilots about the perils of flying with the wrong attitude. The recent loss of an AirAsia Airbus A320 serves as an example: The accident investigation board cited a solder crack in a circuit board as a causal factor – it did indeed set off a number of events which clearly caught the pilots unaware, but the major cause was the pilots’ inability to recognise their aircraft’s departure from the intended flight path – and their “incapacity” to recover from that upset, potentially due to a mixture of “carelessness and neglect”. Flight path management is the pilots’ primary task. There are obviously other tasks to be accomplished (navigation, weather avoidance, radio work and a myriad others) but controlling the aircraft’s current and projected trajectory by way of energy management remains the most important. It tells me that pilots would rather leave the flying to computers and autopilots, while they fiddle with circuit breakers and try to figure out “what this thing is doing now”. It would appear that the captain of AirAsia 8501 was out of his seat to pull circuit breakers without consideration of the consequences and when the Airbus went into “alternate law” the FO could not accomplish the basic recovery from a stall event at altitude. (The same problem the pilots of AF447 had over the Atlantic Ocean). High altitude flying comes with its own set of problems. I won’t bore you with the definitions of “coffin corner”, but at high altitude aircraft have three possible limitations: Certified altitude, Thrust Limit Altitude, and Buffet or Maneuvre Margin. The fancy FMC (Flight Management Computer) will provide you with a limited bank angle which won’t exceed the current available thrust limit, only if you’re operating in LNAV (Lateral Navigation) mode. In any other mode – and this is what many pilots miss – you need to maintain your own speed at least 10kts above the lower buffet limit and use a maximum of 10 degrees of bank. Should you run into the thrust limit, you can only reduce bank angle, increase thrust to max continuous, or descend (or all three). Which all goes to show that at those altitudes the potential for control loss is very high. In a recent blog, David Learmount ( http://www.Learmount.com ) stated that in 18 control loss accidents since the year 2000 almost 2000 people lost their lives. That is simply unacceptable. Crashing an aircraft which, despite some technical issues, is fully flyable, is an indictment of our pilots’ level of training and expertise. It is not the jet that gets upset – it has no emotion in this regard. It is the pilots who should be the last barrier of redundancy, but who are failing by causing the jet upset.